Last week, I wrote about the importance to keep our feelings in check when it comes to worship. For there are some people who merely sing based on how they feel instead of singing on the basis of who God is. This week, I like to expand my reflection on the topic of singing and worshiping on Sundays. Three views in particular are pertinent as we continue on this subject. The first is a more positive continuation of the worship experience in singing, where due to a cultural change, people no longer sing about God, but TO God. In this view, we note the positives when letting feelings guide our singing and in our worship. This is a slightly more redemptive view from the perspective of wanting to be authentic before God. I call this view the "Authenticity View." The second view is also more redemptive but in a manner that reflects the way people are created: Extroverts vs Introverts. In this view, we note that one reason why not everyone sings as directed is because they are uniquely created to respond only in a certain manner. I call this the "Musical View." The third view is my contribution, where I will try to bring about a balance between feelings, our created beings, and our theological response. I call this view a "sacramental view", where worship and singing is part and parcel of a practical theology demonstrated in a sacramental spirit. In the article "Have Christians Stopped Singing?" David Murrow, author of Why Men Hate Going to Church, observes that worship is no longer what people do but what people feel. He attributes the problem to an increasingly entertainment culture where the place is the theater and the audience mere spectators. No longer are people content to simply sing because the worship leader in front asks them to. For every "Let us sing," one mutters "Why should I?" For every "Let us stand," these think "Oh no, not again." If I follow Murrow's arguments correctly, he is placing the blame squarely at the way organizers have unwittingly created an environment that stimulates desires for entertainment instead of invitations to worship. Think of the dim lights. Think of the platform in front that looks more like a movie or theatre rather than a sanctuary. Think of the musical equipment in front that appears more like a professional music rock band rather than a traditional Church organ. In a dimly lit atmosphere, the worship leaders cannot see clearly whether the people are singing or participating with them. With blaring sound systems, loud drums and electric guitars, the band jazz it up so much that the sounds from a few easily drowns out the voices of the congregation. When the songs used are unfamiliar, the problem becomes worse. At best, worship then becomes a matter of a ragtag crew of professional musicians and singers dragging the rest of the congregation to put up a performance for God. At worst, worship becomes a time where the band lets out their vocals and synthesizers, while the rest of the congregation waits for the whole performance to be over. Along the way, if there is some music to enjoy, members can sit back, relax, and catch a nap before the sermon. If Murrow is correct, the reason why people have stopped singing is because the very environment they enter into each Sunday is more conducive for performance and entertainment, and less appropriate for praise and worship. In other words, there is nothing wrong with people wanting to be authentic in their worship. 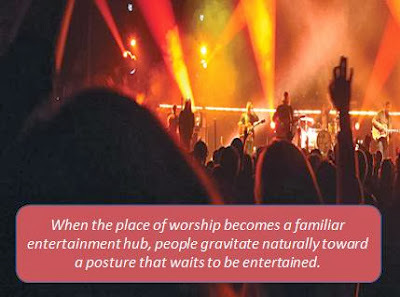 When the place of worship becomes a familiar entertainment hub, people gravitate naturally toward a posture that waits to be entertained. This is particularly for churches that have purchased defunct movie theatres, concert halls, and formerly entertainment venues. If a place is not designed for worship in the first place, it is hard to facilitate worshipers to consciously switch to worship mode. After all, when people go into the cinema, they sit down with their popcorn and silently watch the movie. If they enter a rented cinema, of course they will sit down and wait for something in front to keep their senses occupied. In contrast, people who enter a well designed Church, say an old classic Anglican Church with painted windows and iconic images of the Divine will enter with a sense of awe. I remember my visit to a Roman Catholic Westminster Abbey in Mission. The first thing I felt was the awe of being in a sanctuary of worship where people are hushed into silence and reverence not with words, but with breathtaking admiration of the beautiful architecture and the invisible smell of incense that fills the whole cathedral. In the modern evangelical Church, many churches look like cinemas, concert halls, and some are even located in the midst of shopping malls. If the malls are packed with consumers, imagine having the Church in the heart of the symbols of consumerism! Will that not turn church goers into consumers rather than worshipers? How then can we fairly expect congregations to worship authentically in spirit and in truth? KEY: There is nothing wrong in worshipers wanting to sing what they feel. Churches need to relook at the way the worship halls, ambience, and environment if they want to help worshipers sing better. Having less resemblance to entertainment halls of the world will help to some extent. The second view brings focus back into the kind of music selected during worship services. In many congregations, familiarity with songs increase audience participation. That is Murrow's view too. Agreeing, Stephen Altrogge thinks that we need to be more flexible in our expectations of the people. In "Maybe we should stop encouraging people to get out of their comfort zones," he observes that the types of songs most churches use tend to be "biased toward extroverts." This includes the typical worship service. The people who raise hands, who participate well at the onset, and those who respond to the requests by the worship leaders in front tend to be extroverts. If Altrogge is correct, that will imply the need to have songs that will enable both extroverts and introverts to sing. In other words, if we want more people to participate in singing, we need to make sure that the songs selected will fit a wider repertoire of people in the congregation. While it is true that worship is all about God, it is also about calling the worshipers to come forth together as a people of God. It is like leadership. Good leaders are not those who are skilled individually. Good leaders are those who have followers. If a leader does not have any follower, what kind of a leader is that? Thus the worship leader needs to understand the audience and to choose the appropriate songs to encourage more to worship together. Altrogge's view is also redemptive in a way because it looks squarely at the make up of the individual person in the congregation, and gives the person the benefit of the doubt. It is not that people do not want to sing during worship. It is that people not pressing the right buttons for the right effect. KEY: Congregations are made up of both extroverts and introverts. Ensure that songs chosen are appropriately matched to the sorts of personalities within the Church. This does not mean fitting the songs to the congregations. It is choosing appropriate songs to maximize the climate of worship for the glory of God. The earlier two views put the onus of the worship on the place and the worship leader to spur the mood of worship. The problem is, they do not go far enough. We need something else to guide. That is where John 4:24 comes in. Worship must be in Spirit and in Truth. In this view, I will address the singing and worship in the Church within the context of a theological understanding of what worship is. We need to bend our wills away from feelings, away from our presumed natural tendencies, and to a discipline of heart, mind, and soul toward truth claims in Christ. We need to discipline ourselves away from blaming the environment and focus on God. We need to learn as many kinds of songs as possible. For extroverted people being asked to sing songs that are more introvert in nature, they need to remember that when they participate, it is the togetherness that matters more than one's inner emotional highs. The same goes for introverts not to allow the songs to dictate how they participate. Allow the focus on God to lead. Allow the Spirit to move. Allow the Truth to surface as we sing the Truth week after week. Chan has a point, but in the light of the above two views I have mentioned, Chan may have been too critical or harsh on the use of contemporary music. Maybe, the way forward is to modify the songs and music that are currently being used. Instead of concentrating on the sacraments and the devotions, I prefer to use the word "sacramentally." Like approaching the throne of grace with fear and trembling, we learn to bring ourselves and our sacrifices of praise sacramentally with reverence and respect. We do so with an attitude of humility and lowliness. When we sing a song, we think back on the gospel story. We retell the story of Christ. We affirm the coming of the Spirit, the love of the Father, and the sacrifice of Jesus. We come together in the Name of Jesus before the Triune God. The reason we sing is to worship. Singing is just one aspect of worship. In worship, there is a bigger concern: the spiritual state of the worshiper. Jesus did not die so that we can sing. Jesus died so that we can live in Him forever. Songs are not about music. It is about the sacrament of worship that needs hearts that are sanctified in Christ. The sacramental view is less to do with feelings, environment, or songs. It is affirming the Divine God in ALL we do. It is in telling the story of the gospel together as a people of God. It is singing the truth (doctrine) in love (participation). Out of this awareness, if there is one reason why we should NOT sing, it is this: Broken relationships. Think about our relationship with our fellow brothers and sisters. Do they have a grudge against us? Do we have a grudge against them? If we do not sing, it is basically because our relationships have not received the grace of forgiveness from us. Unforgiveness prevents us from telling and retelling the story of the gospel with a right heart. Right theology in worship means having our hearts rightly grounded in obedience to Scripture. Good theology is rich in applied theology. Applied theology is practical theology in mind, heart, and soul. There is no such thing as an intellectual theology. Right theology is intellectual AND practical. Sing well. Sing cheerfully. Sing sacramentally.